District softball tonight has the Prairiland Lady Patriots taking on Mt Vernon. This game was originally scheduled in Pattonville but was changed when the first meeting was moved to Prairiland. The Lady Pats only loss in district was to Mt Vernon 12–3. 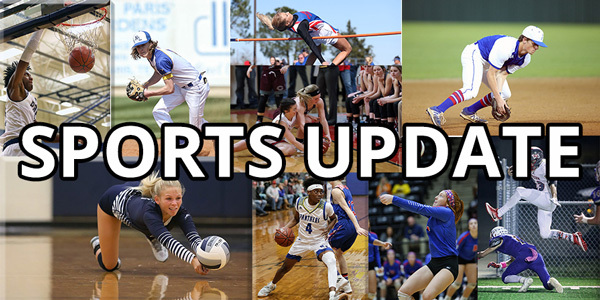 The Chisum Lady Mustangs will host Commerce, Liberty Eylau is at Paris, Cooper travels to Chapel Hill, Rivercrest is at Como Pickton, and Detroit hosts Saltillo. On the baseball diamond Chisum and Prairiland play the first of a home and home series tonight at Prairiland. Game two is Friday at Chisum. The North Lamar Panthers will be in Pittsburg while Paris travels to Pleasant Grove. Cooper is at Mt Vernon. And Detroit travels to Avery. It has been a great year for both the girls and boys soccer teams at Mt Pleasant High school. This Friday afternoon at 12:30, the girls will face Independence at Frisco in the Regional Semi-finals. And, the boys will take on Heritage at 3:00 pm, also in the semis, and also at Frisco. Because of this historic achievement, there will be no school for the MPISD on Friday to allow fans to attend the games. Tonight could be the final home game for Dirk Nowitzki as the Mavs host the Phoenix Suns at 7:30. After four quiet days at the plate, the Frisco RoughRiders erupted for an 11–2 win over the Corpus Christi Hooks Monday night at Dr. Pepper Ballpark. Frisco scored all 11 runs within the first five innings, including four-run frames in the second and third. Preston Beck hit two homers on the night, collecting his third-career multi-homer game. After an off day yesterday the Texas Rangers begin a two-game series in Arizona tonight on 1490 AM and 96.3 FM KPLT. Pregame is at 8:00 pm with first pitch at 8:40. There’s a new King of College basketball. The Virginia Cavaliers defeated Texas Tech in an overtime thriller, 85-77. The Red Raiders were down double digits but came back to take a three-point lead with just seconds left. Then, Virginia’s De’Andre Hunter buried a three to send the game to overtime. In the extra period, Virginia outscored Tech 17-9 and hit 12 consecutive free throws. Former Texas tennis coach Michael Center plans to become the second college coach to admit he accepted bribe money in a scheme with college counselor William “Rick” Singer to falsely identify college applicants as prospective athletes in order to help them get into college. Center, took $60,000 in cash from Singer and accepted another $40,000 donation to the Longhorns’ tennis program in exchange for falsely listing the child of one of Singer’s clients as a tennis recruit. Center’s guilty plea to one count of conspiracy to commit mail fraud and honest services mail fraud could come with a maximum penalty of up to five years in prison and a fine of as much as $250,000.